Great for beginners learning to ride, our budget pick is the Yamaha Moto BMX for its practical, yet stylish design! This 12 in. 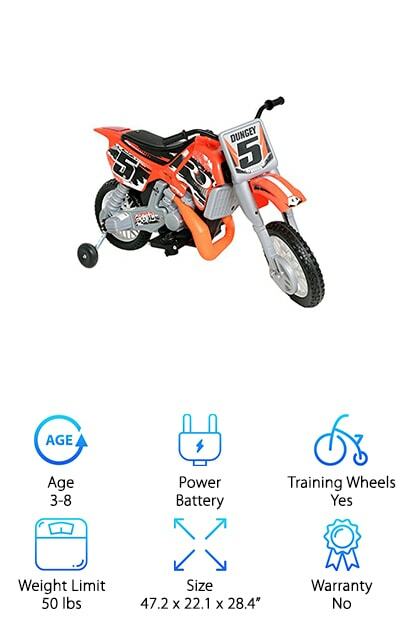 bike features training wheels and plastic mini pedals, so your little rider can master the art with ease. 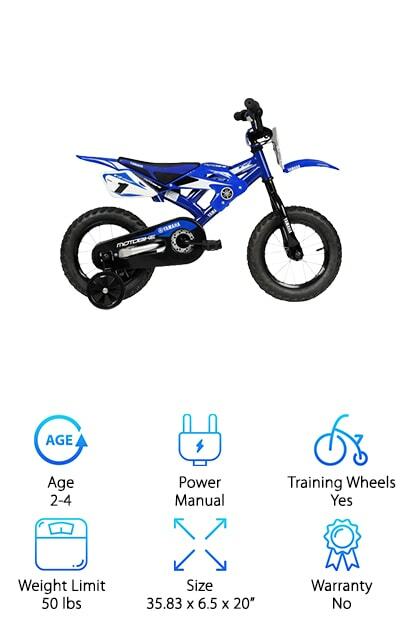 Available in sleek, shiny blue and black, the Yamaha bicycle mimics the style of a professional dirt bike with its 16-spoke steel rims and BMX knobby tires. 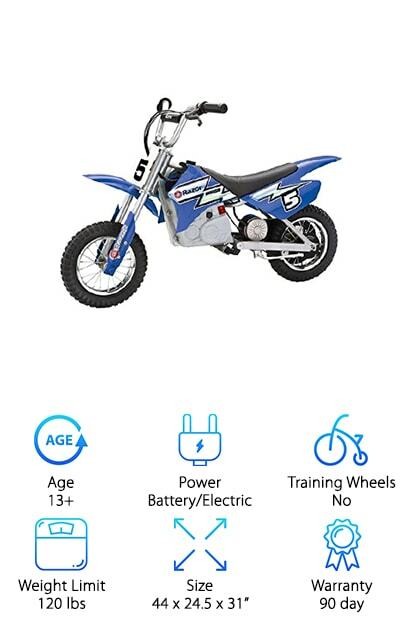 Equipped with steel handlebars and a motocross style seat, the world of youth dirt bikes would be incomplete without this stylish, affordable model. Perfect for riders ages 2 to 4, you can get them started on the world of adventure early. 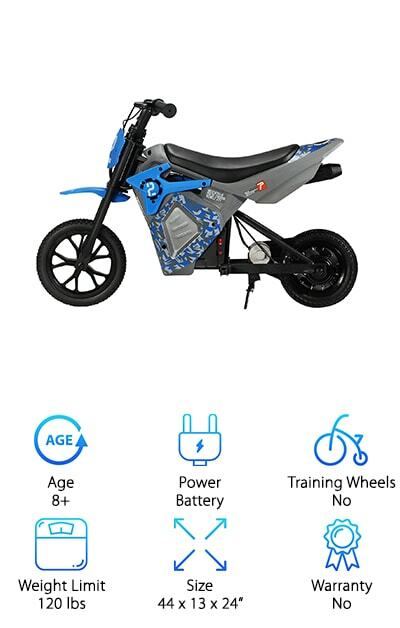 Watch your toddler or preschooler face light up when presented with this cool, unique bike! Best of all, the affordability of Yamaha means you don’t need to break the bank to give them a ride to remember! 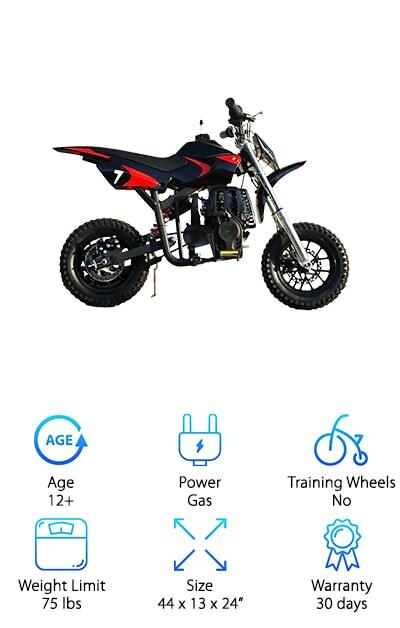 Don’t overlook the Extreme Rider Dirt Bike-- perfect for the little extreme sports-lover in your life! 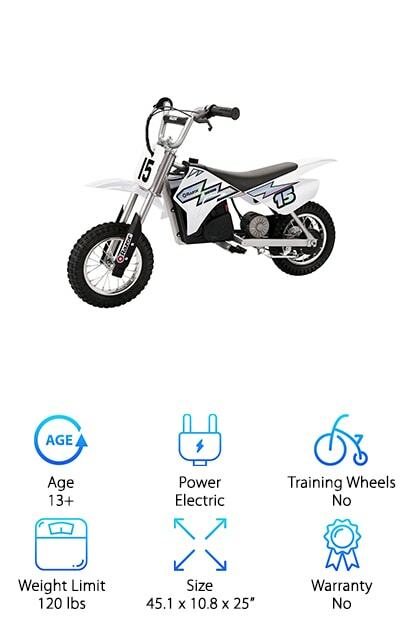 Battery-operated and rechargeable, this professional-looking bike reaches a maximum speed of about 4 mph, making it perfect for younger kids. Safe and durable, only minor assembly is required and an instruction manual is included with your purchase. 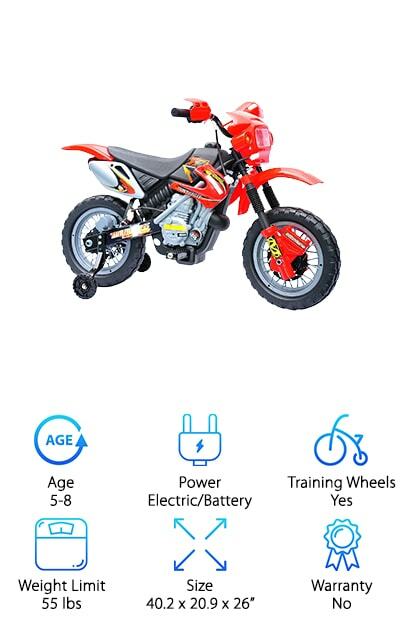 Removable training wheels give your little one the option to start easy and graduate to a two-wheeler when ready. 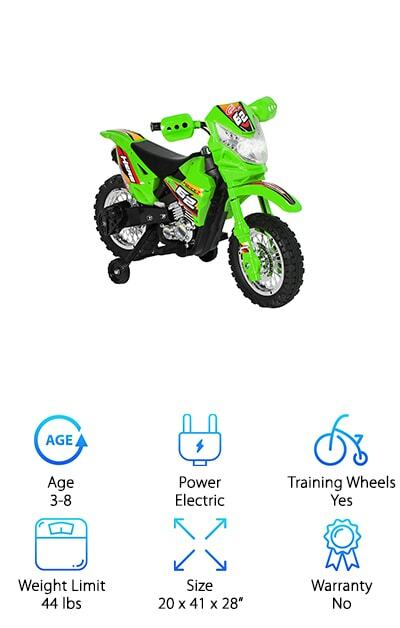 Out of all of the kids’ dirt bikes for sale on our list, we like this one for its electric green color and nifty red tail light under the seat. 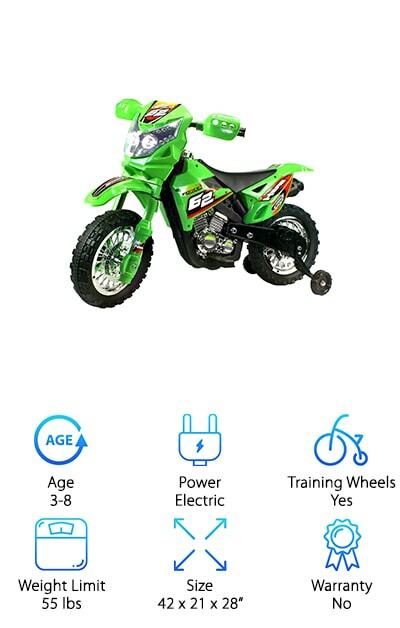 Your child will feel like the coolest kid on the block on this bike. 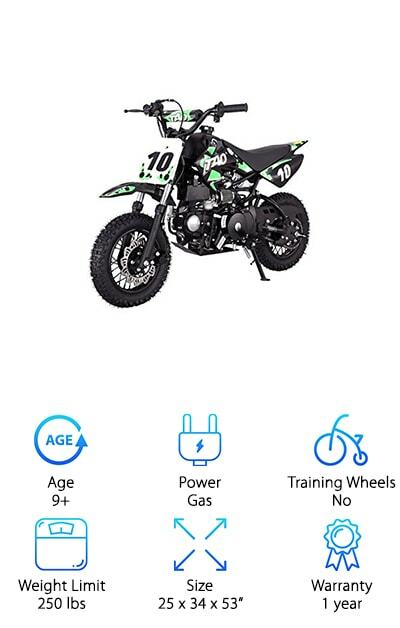 If you’re looking for a safe option that looks like the real deal and runs on power for your little rider, look no further! Pull-start this bike and get your child started on the ride of his or her life! The Starmax is a black and red, stylish dirt bike. It’s so professional looking, that we think this is where it’s it when it comes to mini dirt bikes for sale today. Featuring pneumatic tires, disc brakes, and a suspension, your child will feel like a real rider. The durable design allows this bike to traverse rough terrain, so your mini pro rider’s adventures won’t be limited to small areas. Roll through grass and mud and keep going on the Starmax! With a max speed of 18 mph, the ride does not disappoint and delivers all the thrills you’d expect of a quality dirt bike. Your child will be thanking you for a long time to come. You’ll appreciate the quiet 40cc engine and kickstand. Even better, Starmax comes with a 30 day warranty, so your investment is covered.